HJ: Always remember, life is not happening to you, it’s happening for you. A few weeks ago I had a soccer game about a half-hour away from my house, in the middle of nowhere. Grumbling about the heat and the length of the game, I walked down to the field where my team was seated under a tent. In truth, I love playing soccer, but for some reason I was annoyed at how big a chunk of my day it took. I walked to the portable bathroom, plunked my soccer bag down, and teared up in frustration. How dare the team, the sport, the world violate my time? I walked back over to my team, fuming inside. I thought about the homework I still had left, the near hour I could have spent writing or playing guitar or being quiet and meditative. But I was stuck on a dirt patch miles away from home, sitting in my soccer clothes, with nothing to do but wait. Then I thought of the radio show I’d been listening to in the car on the way there. It was about Taoism and the importance of accepting what exists and the natural order of things. The world, the host declared, is in itself perfect, and when we submit to the circumstances of the world we can find peace. Sitting there on the field, I forced myself to close my eyes, take a deep breath, and feel the wind settle on my skin. For the first time, I was accepting the unfilled time life had offered me rather than fighting it. Meditating on the field was incredible. In that moment, I felt more alive and present than I ever have meditating in my own home. Unlike at home, I was submitting to the natural order of things and my reality. Rather than building time for meditation, I was receiving it. I don’t know a single person who doesn’t consider themselves busy. We live in a world of technology and mobile devices that allow us to be working constantly. Our biggest rival is time, and our most formidable fear is running out of time before deadlines, projects, and our own eventual demises. Because of the finite amount of time we have on this planet, I always thought of time as something I had to organize and maximize. I planned my week and activities so I could have large chunks of unstructured time to get things done. I avoided having short periods of empty time like the plague. The more I structured my time, the more stressed I became. I was frugal with my time like I would be with money. I was miserable in the face of rescheduling and spontaneous events. Everything the world threw at me threatened to destroy my entire week’s plans. The more I tried to maximize my time, the more I felt like a victim to time itself. The spontaneity of the world became my enemy. In trying to use every moment to its fullest, I had turned myself against the present moment and the natural order of things. That day on the soccer field changed me in a profound way. That day, I let go of my schedule, my compulsive need to structure my time, and my hatred of the ever-changing world. I embraced the moment that was given to me and allowed myself to be immersed in the time and space I occupied. I had never before recognized that I was in a constant battle against time. I now see this battle playing out every single day in my life. I get stressed whenever I have five minutes to “kill” without my computer or cell phone on which to do my homework. These empty moments threaten us because we don’t know how to accept the emptiness that life offers us. In all of our haste to complain about such moments, we miss the opportunity they offer us to tune into the world and submit to its natural perfection. We miss the truth: that every moment, not just the ones we set aside for meditation, can be used to appreciate and revel in the present. Emptiness is not evil. Emptiness allows us to breathe, feel, and accept the world as it is. Ironically, I always wanted more time in which to meditate. I felt like I could never find a chunk of free time in which to simply enjoy the present moment. Now, I realize that they are all around me, but I fill them with anxiety instead. If you’re tired of feeling like time is against you, worn down from all the frustration you’ve felt toward the world and the circumstances taking your time, you must back down from the fight. The world will always win. Fortunately, if you accept the world and the time you are given rather than rebelling against it, you also win. That is the perfection of the world: we benefit most when we let the world carry us. That is not to say that making plans and organizing your time are useless endeavors. It is important that, as a society, we continue to put time into our jobs and families. I am not preaching a breakdown of schedule, but an acceptance of change. Instead of using meditative strategies only in the comfort of your home or nature, find the beauty of the present moment in the time the world gives you to be still. Feel your weight in the seat of your car and the smoothness of the wheel in your hands when sitting in traffic. Close your eyes and feel your lungs expanding when someone is running late for a meeting. Spend those interim moments of inaction in your life being at peace with the world rather than grumbling at your watch. Those minutes add up, day by day, into all those minutes you wish you could spend meditating instead of sitting in the office. Empty time is not forced upon us; it is given to us. Empty time is a gift. Yield to it and accept it, and you will find yourself more in tune with the present moment and more accepting of life and the world. 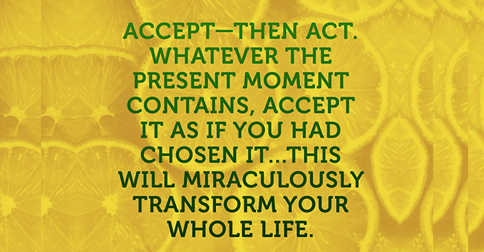 The present moment is a gift that we are always receiving. Our choice is whether to deny the gift and suffer, or open it and feel the world’s perfection within and around us in the ever-present now. Avery Rogers is a high school student in California. She aspires to be an author, spiritual writer, and neurologist when she grows up. She recently began her personal blog, Pluto’s Journal, at plutosjournal.wordpress.comwhere she shares her insights about growing up, love, faith, and meaning. Visit her blog for contact information and more of her work.